One of the key elements of RoCKIn is benchmarking. During RoCKIn competitions and events, several datasets have been collected to be redistributed to the Robotics community for further analysis and understanding about the task level and functional level performance of robotics systems. The 6-camera MoCap system used for the FBM1 at RoCKIn Competition 2014. Below the cameras, the table and the objects used for the benchmark. Another view of the MoCap system of Camp 2015. 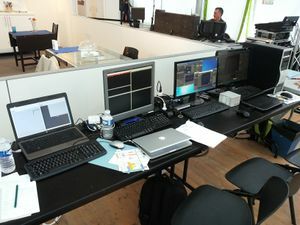 Some of the computers used to produce, collect, process and log MoCap data at the 2014 Competition. Motion capture (MoCap) logs comprise very accurate ground truth pose data, generated with a specialized system. These data should be especially useful to the teams who participated to the RoCKIn Competitions. In fact, they allow the teams to check their robot's own pose estimate against the ground truth, which should lead to a better understanding of the performance of the robot and make possible improvements easier. In a nutshell, the RoCKIn MoCap system includes one or more commercial MoCap rigs and a customized interface towards ROS. Each MoCap rig is composed of several specialized infrared cameras and a proprietary software package. The ROS interface collects the data streamed by the MoCap rigs, extracts pose data and publishes them as messages on ROS topics. Finally, these messages are recorded in bagfiles for subsequent analysis and distribution. For simplicity of management, every hour the current bagfile is closed and a new one is started: therefore each logfile covers a hour-long period of time (or less). More information about the RoCKIn MoCap setup is provided by Deliverable D2.1.7. The RoCKIn Competition 2014 took place in Toulouse (France). The RoCKIn MoCap system at Toulouse comprised three separate rigs: one for the RoCKIn@Home TBM testbed, one for the RoCKIn@Work TBM testbed, and one for the area dedicated to FBM1, which was used for both @Home and @Work. RoCKIn Camp 2015 was held in Peccioli (Tuscany region, Italy). 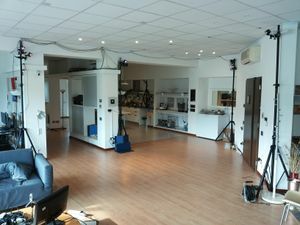 In Peccioli, the RoCKIn MoCap system was composed of a single rig, used for both RoCKIn@Home and the Functionality Benchmarks (which took place in the @Home testbed). The RoCKIn Competition 2015 took place in Lisbon (Portugal). The RoCKIn MoCap system at Lisbon comprised two separate rigs: one for the RoCKIn@Home TBMs and FBMs, one for the RoCKIn@Work TBMs and FBMs. For the association of MoCap bags, Ground Truth, and the corresponding Robot bags please refer to the following files. Functional benchmarks, both in RoCKIn@Home and RoCKIn@Work, are used to evaluate specific skills of the robots in a repeatable and controlled manner. To foster research progress in acquiring those skills we share here the data collected from the robots during the different RoCKIn events so to let other teams to prepare and learn from other experiences. The following datasets have been collected for the Object Perception Functional Benchmark during the competition. They have been extracted from the ROS bags collected by the robots and from the logs provided by the teams that have participated to the benchmark. fbmh1_dataset_01: complete dataset extracted from the Homer team bag FBMH1_20141129_homer_02.bag; it contains GT, PCD images, RGB images, RGB camera calibration and depth camera calibration. fbmh1_dataset_02: complete dataset extracted from the Homer team bag FBMH1_20141130_homer_04.bag; it contains GT, PCD images, RGB images, RGB camera calibration and depth camera calibration. fbmh1_dataset_03: dataset extracted from the Homer team bag FBMH1_20141129_homer_03.bag; it contains PCD images, RGB images, RGB camera calibration and depth camera calibration. fbmh1_dataset_04: dataset extracted from the Pumas team logs FBMH1_20141128_pumas_01; it contains GT and RGB images. fbmh1_dataset_05: dataset extracted from the Pumas team logs FBMH1_20141129_pumas_02; it contains GT and RGB images. fbmh1_dataset_06: dataset extracted from the RoCKIn team bag FBMH1_201503212233_RoCKIn; it contains GT, PCD images, RGB images, and RGB camera calibration. fbmh1_dataset_07: dataset extracted from the RoCKIn team bag FBMH1_201503212301_RoCKIn; it contains GT, PCD images, RGB images, and RGB camera calibration. fbmh1_dataset_08: dataset extracted from the RoCKIn team bag FBMH1_201503212306_RoCKIn; it contains GT, PCD images, RGB images, and RGB camera calibration. fbmh1_dataset_09: dataset extracted from the RoCKIn team bag FBMH1_201503212303_RoCKIn; it contains GT, PCD images, RGB images, and RGB camera calibration. fbmh1_dataset_10: dataset extracted from the RoCKIn team bag FBMH1_201503212253_RoCKIn; it contains GT, PCD images, RGB images, and RGB camera calibration. fbmh1_dataset_11: dataset extracted from the RoCKIn team bag FBMW1_201503220914_RoCKIn; it contains GT, PCD images, RGB images, and RGB camera calibration. The following datasets have been collected for the Object Perception Functional Benchmark during the RoCKIn eventsThey have been extracted from the ROS bags collected by the robots in the @Home testbed using the RoCKin@Work objects. fbmw1_dataset_01: this is a dataset extracted from the RoCKIn team bag FBMW1_201503212338_RoCKIn; it contains GT, PCD images, RGB images, and RGB camera calibration. fbmw1_dataset_02: this is a dataset extracted from the RoCKIn team bag FBMW1_201503220001_RoCKIn; it contains GT, PCD images, RGB images, and RGB camera calibration. The Spoken Language Understanding Dataset is a resource that has been gathered to provide data for the Spoken Language Understanding task, specifically for the Functional Benchmark #3 in the @Home track of the RoCKIn Competitions. It is basically composed by audio files representing possible commands given to a robot in a house servicing scenario. Each audio file is paired with its correct transcription. Moreover, a semantic representation of the action expressed in the command has been also provided, according to the formalism described in the @Home Rulebook. This resources can be thus used for different purposes, ranging from Speech Recognition to Natural Language Processing. The dataset has been collected in different moments, both inside the scope of the RoCKIn project (e.g., at the camps and competitions) or outside of it (e.g., at Robocup 2013). The updated complete dataset can be downloaded here. The .zip file contains four directories, each representing a portion of the dataset. Each directory contains all the audio files, plus two file called transcriptions and interpretations, where each file name is associated with the corresponding transcription and interpretation repsectively. Moreover, an additional directory called xml is added to each data set directory. It contains the .xml files with morpho-syntactic analysis and interpretations as defined in the HuRIC data set (see the Rockin Wiki here for further information). The Robocup directory contains the audio files that have been gathered during the Robocup 2013 in Eindhoven. Such dataset has been provided to the participants in the RoCKIn@Home Competition 2014 as a benchmarking resource to train and test the systems for the Functional Benchmark #3. The Rockin1 directory contains the audio files that have been recorded to be used for the Functional Benchmark #3 of the RoCKIn@Home Competition 2014. 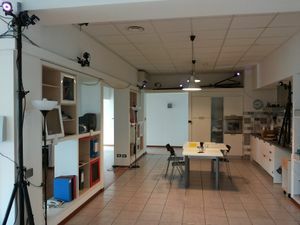 The Rockin2 directory contains audio files that have been collected during the RoCKIn Camp 2015, with simluated interactions between users and robots in the "Casa Domotica" environment at the Service Robotics and Ambient Assisted Living Lab in Peccioli (Italy). 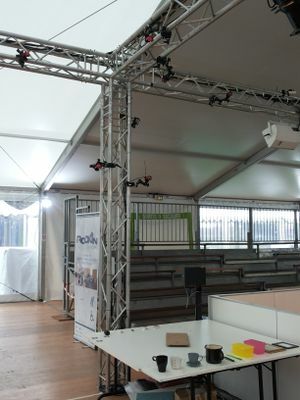 The Rockin2014_Toulouse directory contains the audio files that have been recorded by the microphone systems of the robots participating in the FBM3, during the live part of the benchmark. Some humans uttered a list of commands, reproduced with a loud speaker. Robots had to use their microphones to capture the audio and to analyse it. This page was last modified on 22 December 2016, at 12:13. This page has been accessed 450,137 times.